The Haggard Mind: Giving Thanks for What? Thanksgiving did not originate as most of us think it did. I have spent some time (probably not enough, though) studying this holiday that everyone remembers, and here are just some of the facts about how it started. 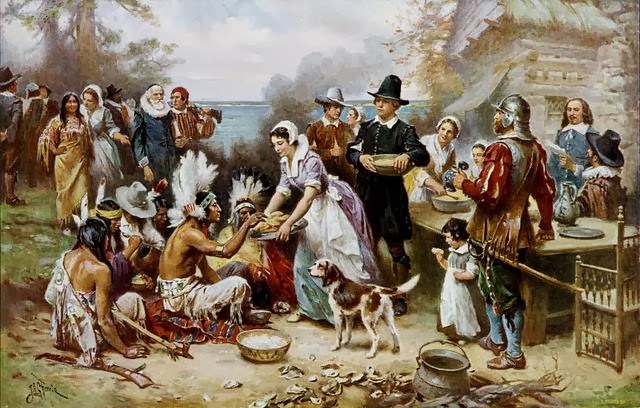 The first thanksgiving celebration in what would become known as "America" happened on September 8, 1565. A Spanish explorer named Pedro Menéndez de Avilés landed in Florida. He was grateful to have arrived safely, and held a feast of giving thanks with a group of the Timucua native Americans. They stuffed themselves with a bean soup. In 1820, the Timucua became extinct, thanks to European diseases and invasion warfare. In the "Commonwealth of Virginia," thanksgiving feasts and celebrations are recorded from as early as May 14, 1607. Captain John Woodlief declared, "the day of our ships arrival at the place assigned for plantacon in the land of Virginia shall be yearly and perpetually kept holy as a day of thanksgiving to Almighty God." I haven't found the reason for it, but 9 people there, and about a third of the colony population, were killed by the Powhatan Indians in 1622. "The First Thanksgiving, 1621" by Jean Leon Gerome Ferris. natives never wore these great plains styles. The story we all think we know from Massachusetts isn't much different. The Pilgrims were NOT Puritans. They were a political group of English Separatists. (The Puritans had settled nearby, where Boston is now, but were not part of this story.) All but about 50 of the Pilgrims died over the winter of 1620. The survivors only lived because the Wampanoag Indian tribe taught them how to plant, gather, and preserve foods. After their fall harvest in 1621, they celebrated a feast of thanksgiving. The food was deer taken in the forest by natives, fowl raised by the Pilgrims, natural nuts from the forest, seafood, and various harvested grains. The celebration lasted 3 days. Within 20 years, the Wampanoag were nearly wiped out by the combination of disease and the Pilgrims' belief that they had the right to take over the land. Native elders rarely saw any of the true Christian settlers who followed a highly desirable "spirit-man" named Jesus. Christian leaders rarely saw natives who started every day by giving thanks to Creator for life, and celebrated every gift from him. Neither understood the other. Only a few of both sides truly loved God with heart, soul, and mind. On the rare occasions when they faced each other through the love of God, they lived in peace. All Americans should know the truths about the Thanksgiving holiday. (And I'll tell you now, I have only scratched the surface here.) We should learn from its history, then we should let that history pass. It was good in some ways, and evil in others. But what about today? Today, just make it a holiday of giving thanks to God for whatever blessing you have received, and for bringing you through whatever hardships you have faced. God loves every person to the point that he gave his only Son, that through the cross all could accept his love. Meet your neighbors with that love, and share your thanksgiving. Who do we hate? Who do we ignore? If we are truly saved by and living for Jesus Christ, we can't hate or ignore anyone. What are we missing? What do we have? Whatever our conditions may be, whether the table is loaded or light, give thanks to God for the greatest gift he has given, Jesus Christ, and reach out with the love from that gift to everyone else.